Does your front walkway resemble the Dead Marshes in The Lord of the Rings – that horrifying landscape that the hobbits (and one ex-hobbit) had to cross on their way to the fiery volcano? Do your friends ask, “Hey, where’s Mordor?” when they visit? Maybe it’s time to revisit the landscape along your front walk. The simplest option is to have the walk bisect the lawn. The key to pulling this off is to create a lawn shape, and then have the walk cross the lawn. No plants are needed along the walk, except where the walk crosses any planting beds, such as the one around the foundation and front porch. You may already have a perfectly good walk, in which case you still need to design a nice lawn footprint for the walk to cross. If you want to plant something besides lawn along the walk, try not to cut out a two foot wide strip of grass along both sides and fill the space in with a gauntlet of soldier-like shrubs. Here are some tips. Use low growing grasses, groundcovers, and perennials instead of shrubs. Since grasses and perennials die to the ground each winter and grow up from underground (or at-ground) buds each spring, they won’t be the maintenance pruning hassle that shrubs may be. Perennials and grasses may spread, though. You may have to weed out the ones that pop up too close to the walk. And they like to do that! 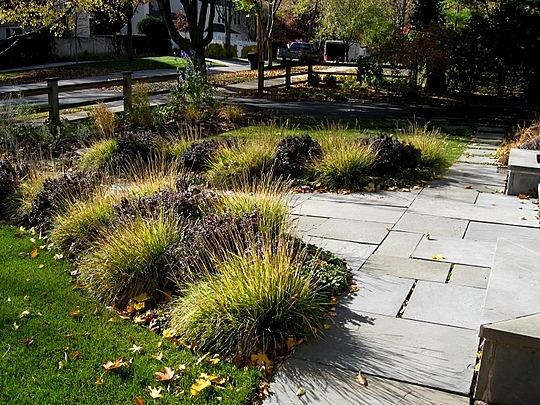 Perennials and grasses can get pretty aggressive along walkways and driveways – I think the plants get a boost from the warmth conducted to the soil from pavement in the spring, along with added moisture from the runoff of rain water in the summer. There should be an attractive lawn footprint on each side of the walk. Don’t think about planting bed shapes, think about lawn shapes and bed depths. If you do use shrubs, absolutely use small shrubs like varieties of Japanese spirea. Take the “mature size” of the plant, add at least 50% (because they always understate those sizes), divide by 2, and plant them at least that distance from the walk. I’ve evaluated landscapes where I had to turn sideways to get squeeze between the overgrown shrubs to get to the front door. By the way, don’t get tricked into planting “dwarf” lilacs along a walkway. Avoid planting in rows that follow the path of the walkway, like the boxwoods in the picture below. Both sides do not have to be mirror images of each other. In the picture above, the same three plants are used on both sides, but they are arranged a little differently. Use some elements of the front walkway landscape in the front foundation landscape. Keep the depth of the planting area nice and wide on both sides. 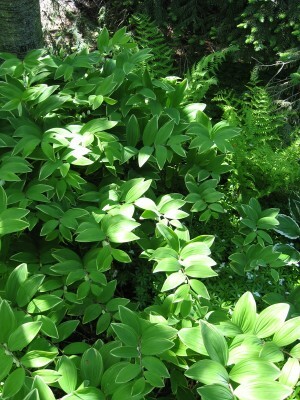 Low growing perennial or groundcover foliage can certainly spill over the edge of the walk. Grasses like prairie dropseed spice up the bleak winter landscape, but you may have to do a little trimming along your walkway in late fall because any foliage hanging over can get caught in your snowblower and bring it to a dead stop. Your front walk should be inviting, like a smile and a handshake. Visiting friends shouldn’t have to hack their way to your door. They should leave their machetes under the seats of their cars where they belong. Unattractive front walkway. Note the weeds, the exposed lighting wires, and the scraggly boxwoods.